In many homes, the garage is nothing more than a place to park the car, store the Christmas decorations and hang up a few rakes. In Louisiana, however, things can be a little different, especially given the flooding the area can receive. 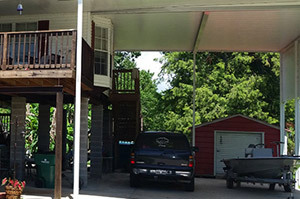 When your home is getting elevated, your standard garage, with a little ingenuity, can be transformed into an awesome carport space that is comfortable, and a lot more fun than all the other rooms in the house. To create the perfect garage space, our first step is to create defined areas: one for your car, one for your workshop and one for kicking back and enjoying a space of your own. In each area, we use smart storage to hide tools and other garage items away. Metallic tool chests can create an industrial feel for the space, while wooden cabinets can be stained for a more upscale look, or painted to keep things casual and visually interesting. Most likely, these areas will not be enclosed because of the nature of raising a home, so protecting them from the elements is crucial. Your different areas can work fine in an open plan concept; once you get the areas organized, they’ll naturally stand apart from each other. For a more formal division of space, we can get creative with partitions. Lowe’s Construction, LLC can build a unique screen and create customized looks that you are sure to love. Whatever you have in mind, give us a call today and see what we can do for your garage or carport! Please take a look at our photo gallery or feel free to read the reviews from several of our most satisfied clients. Responsiveness – One call to us and we move fast to help you. Reliability – Our company offers on time and on budget year-round services for our New Orleans area clients. Flexibility – We work around you and your environment. We are fully adaptable to any special needs, fully compliant with your billing procedures and can accommodate any special situation with your needed repairs and services. Specialized Service – Lowe’s Construction, LLC has been doing quality New Orleans home elevation services in the area for years. In that time, we have specialized our service to give great care to our work while providing top notch customer service. Locally Owned - and proud of it! We live in the local area and take pride in the work we do here. If you are looking for a professional and experienced New Orleans home elevation contractor, then please call 504-415-5010.